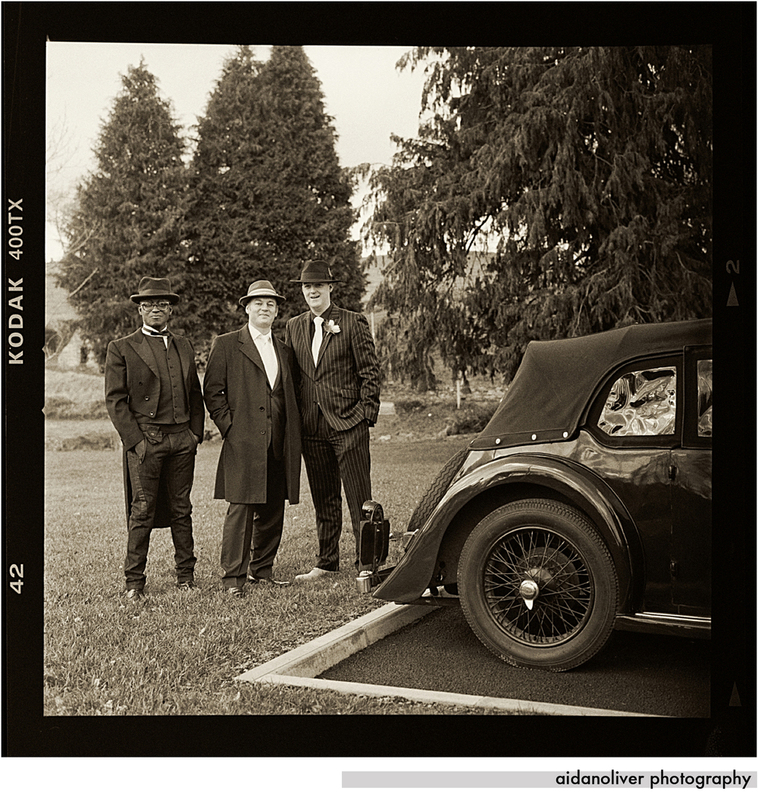 Themed weddings are a rarity and Emma & Chris’s vintage wedding (1920‘s - 50‘s) earlier this year was an even rarer chance to photograph their wedding without the pressure of being the main photographer. My good friend German Collins had this great pleasure to undertake so we were left to wander around as a casual observer. The wedding venue was Cabra Castle in Kingscourt Co Cavan. Regarding fashion, well, we are talking, spats, trilby’s, zoot suits for the men, feather boa’s, empire waisted gowns and flapper outfits for the ladies - vintage fashion was clearly very evident for this fine wedding. We stood and observed, armed with a Hasselblad 503CW and many rolls of Kodak T-MAX 400 film. A mix of both the CF 80mm and CF 50mm lens were used to capture the images as seen below. Available light was measured with the trusty Sekonic L-608 light meter. We did not use flash, just simple ambient light. All images were scanned in using Epson V750 PRO scanner and sepia toned for effect. It was an amazing to go back to (relative) basics for this shoot, the aim being to capture as roughly and naturally as possible a flavour of Emma and Chris’s fab wedding day. Obviously, there were some “acting up” photos which we could not resist capturing. Thanks to Chris and Emma for letting us showcase our relaxed take on this brilliant wedding. We wish them the very best for their future together. Why not call aidanoliver now on 00353 87 2861544 for a brief no-obligation chat. We are experts in the art of no nonsense photojournalistic wedding photography. “Like” us on Facebook here to win a monthly photographic treat.